Extra Large Unit – More Fun, Please! 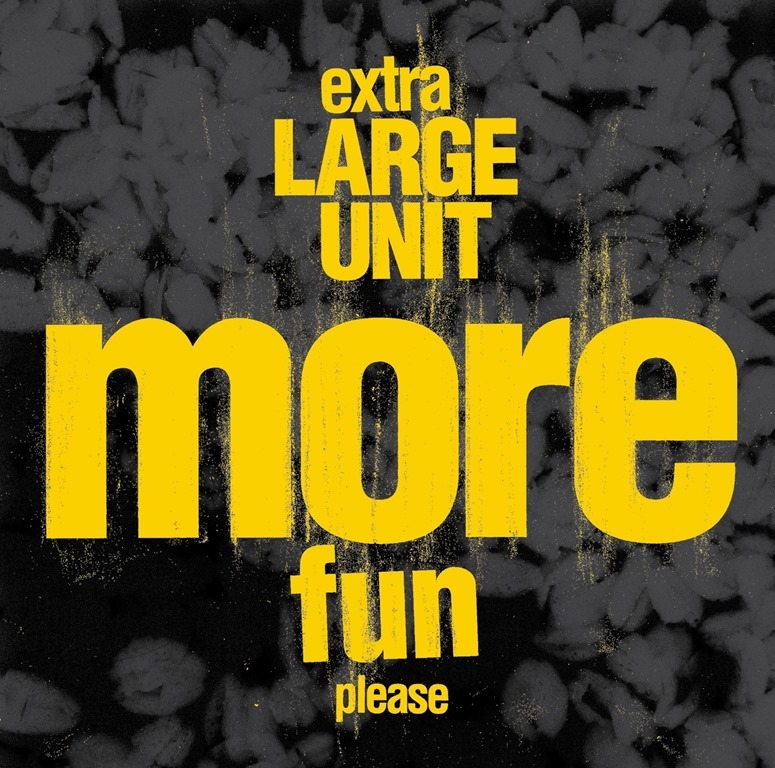 Extra Large Unit is an appropriate collective moniker: More Fun Please! is a live recording of an expanded iteration of Paal Nilssen-Love’s Large Unit ensemble, and features some twenty-seven musicians, in a line-up which features three grand pianos. Yes, three grand pianos. Excessive? Hey, if you’re going to go large, why not go uber-maxi, all-out massive? The accompanying blurb explains that ‘The challenge of composing for so many musicians, while also maintaining the qualities and identity he had established with Large Unit, pushed Nilssen-Love to new creative levels. This was a monumental task…’ And More Fun, Please! is a monumental album. The question is, how much fun can you handle? In his liner notes for the album Nilssen-Love writes, ‘When writing music, I search for extremes, pushing boundaries: physical, dynamic, instrumental limitations, if any, how fast and how slow can one play, how loud and how quiet. I search for unusual ways of thinking. I want to give the musicians trust and have them take initiative and to feel the responsibility of what it is to be an individual player in a group context’. More Fun Please! is a thirty-minute aural rollercoaster, half an hour of highs and lows. At times, it sounds like a classic cartoon soundtrack, parping brass and sudden bursts of percussion; at others, it’s brimming with oriental exploration and eastern promise, and at others still, it’s utter bloody chaos, discord and cacophonous mayhem. In between, there are passages of trilling, tooting, droning and scraping, brought to abrupt halts by immense orchestral strikes – and I mean immense, earth-shaking, and borderline galactic in scale – and plinking, bibbling xylophone breaks. The brass is beyond wild. Words simply aren’t enough. The whole thing is an orchestral frenzy, a riotous ruckus of everything all at once, with sustained crescendos that seem to last forever. It’s a lot of fun… but half an hour is probably about as much of this kind of fun as anyone can handle.